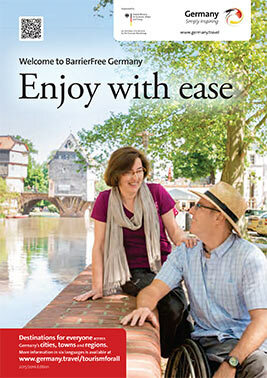 If a trip to Germany is in your future, then be sure and download the excellent Barrier-Free Germany brochure at www .germany .travel / media / content/ barrierefreies _reisen /DZT_ Barrierefrei _Broschuere _EN_UA .pdf. Published by the German National Tourist Board, this handy guide contains nearly 60 pages of helpful resources and detailed access information. It’s also a great idea book, as you’ll find information about accessible historic sites, national parks, museums, attractions and adapted sports offerings. Details about tour operators and travel professionals who can arrange accessible tours are also included. From Hainich National Park, which features an accessible canopy walk, to the cycle trolley ride (operated with handcycles) between Staudernheim and Altenglen, there’s no shortage of unique accessible offerings in Germany; and this well done guide will certainly help point you in the right direction. And when you get down to the brass tacks of planning your accessible Germany adventure, visit www.barrier-free-germany.com and make use of their handy interactive accessible travel planner.